Join us on July 21 at the BORP Adaptive Cycling Center (80 Bolivar Dr, Berkeley, CA 94710) for the 2018 Revolution Kick Off Party! The event is a great way to meet other REV riders, get tips on training and fundraising, and enjoy a ride along the scenic Bay Trail with your team and BORP participants. We’ll be grilling hot dogs, hamburgers, and veggie burgers, so bring your appetite! This is a FREE event, but your RSVP is appreciated! The BORP Revolution Ride and Festival brings people of all abilities together for a day of cycling and celebration to raise money BORP’s adaptive sports and recreational programs for people with physical disabilities and visual impairment. Set against the backdrop of the stunning wine country of Sonoma County’s Alexander Valley, the “REV” is one part cycle-a-thon, one part celebration with food, wine, and post-ride professional massages, and one part inspiration. Join the Revolution and discover what ability is all about! This year the Rev is hosted at the Clos du Bois Winery in Geyserville, CA. See BORP’s website for how to register and for more information. The BORP Hall of Fame and Awards Celebration honors the achievements and contributions of members of the BORP community. The event recognizes outstanding athletes, dedicated volunteers, and bold outdoor adventurers, as well as individuals whose lifetime of achievements and commitment have had a significant and lasting on BORP and the adaptive sports community in the Bay Area and, in many cases, the across the country. Each of this year’s award recipients and BORP Hall of Fame inductees represent the best of adaptive sports through their belief in and commitment to BORP’s mission to enhance the quality of life of people with disabilities through the power of sports and recreation. Come join us at the Ed Roberts Campus on Wednesday, June 13, 2018 as we share their stories, celebrate their achievements, and honor their impact on the BORP community and beyond. In addition to honoring our award recipients, this event will facilitate the funding of BORP’s year-round sports and recreation programs for people with disabilities and visual impairments. 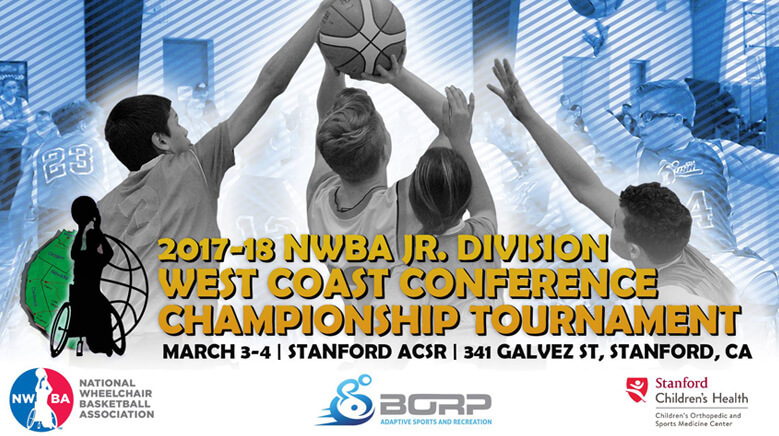 If you represent a company or organization that is interested in partnering with BORP to support this event, please Betsy Dorsett (510-225-7035 / betsy@borp.org) or click here to download more information about sponsorship opportunities. If you would like to support this event as an individual or family, please see the donation options above or contact Betsy Dorsett (510-225-7035 / betsy@borp.org) to discuss. 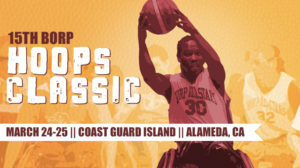 On March 24-25 the BORP All Stars will host the 15th BORP Hoops Classic on Coast Guard Island in Alameda. This has been a tremendous season for the All Stars and we are looking forward to extending our success in front of our home crowd. 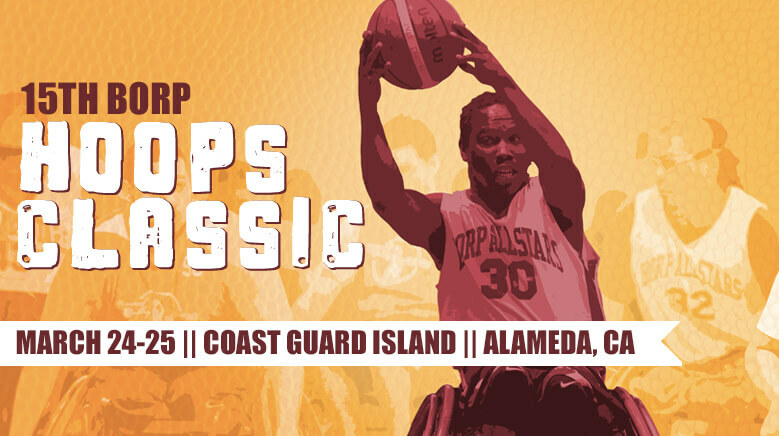 For the 2nd year we are pleased to partner with the Coast Guard on this event and to foster greater awareness of BORP programs to disabled veterans and service members. 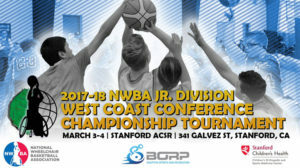 The BORP Hoops Classic typically draws the top teams from Northern California and the competition is sure to be intense from start to finish. And the BORP JR. Road Warriors will join the fun as they match their skills and speed against their elders. Emlen Tunnell Gymnasium, Coast Guard Island, Alameda. Building 16 on this map (click to download). Parking across the street. 1) All vehicles entering the island must have up-to-date registration and insurance documentation. 2) All people 17 and over entering the island must have a current drivers license or government issued i.d. Events: Adapted basketball, soccer, cycling, games and more!